You don’t need me to tell you that there’s a lot of work in a built-up wing. You also don’t need me to tell you that creating the ailerons turns the whole thing into a whole series of Peyton Place. Back in the days when I was building from other people’s plans, the favourite idea seemed to be that the wing should be built to its complete outline and the ailerons cut out afterwards. 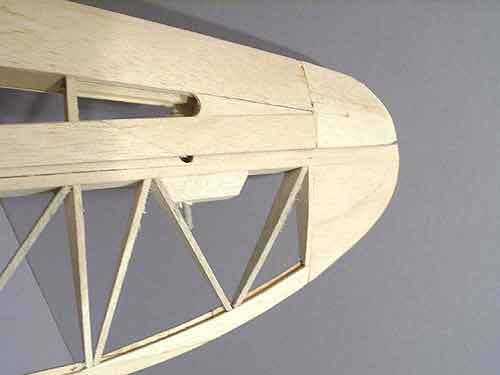 Although this has the advantage that you can be sure that the aileron is the right size and shape in relation to the wing, the downside lays in the considerable hassle involved in separating the two, and then reinforcing and building up the aileron’s LE. Not only that, but it never seems possible to make the darn thing torsionally stiff. 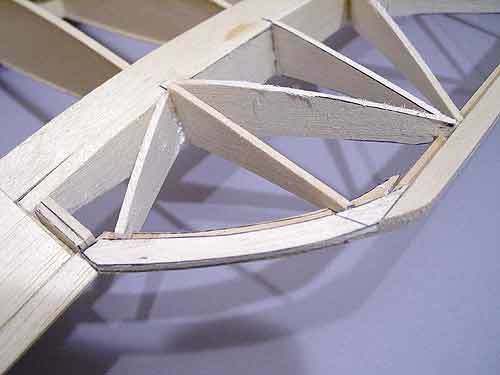 Over the last few years I have evolved one method for building ailerons that I would like to share with those of you that can stand a lot of balsa dust. The principle stems from this problem: to build the aileron flat to the plan involves a great deal of brain wrenching to overcome the problem of jigging the thing up to achieve the correct three-dimensional shape. My idea is this., build the aileron separately in time, but in place on the wing, and do it off the board using your eyes to cheek for trueness. I have successfully used this method over many projects now, and it has met its ultimate challenge in the long, long ailerons of the Petrel. The basis of this method is brutally simple; make the aileron oversize and sand it back down for a perfect fit. 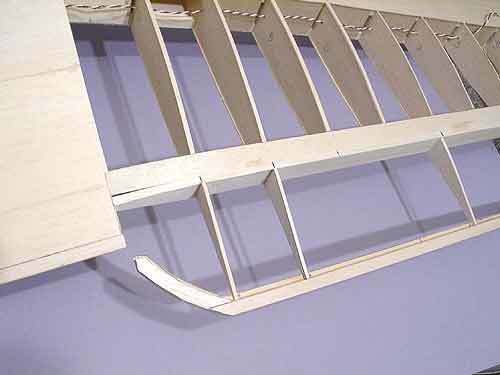 To achieve this we obviously cannot use 1/16″ ribs and caps strips as the cap strips would be sanded to oblivion; we use full-depth 1/8″ ribs instead. Here’s the procedure..
Add the diagonals, and don’t worry about profile accuracy, just make’em slightly over size., you will find that this way it is a fairly quick process. All ribs added: note how aileron is slightly larger than the wing to allow for accurate shaping to the wing later on. This is only possible because of the 1/8″ full depth ribs.. Sand roughly, but not completely to shape. 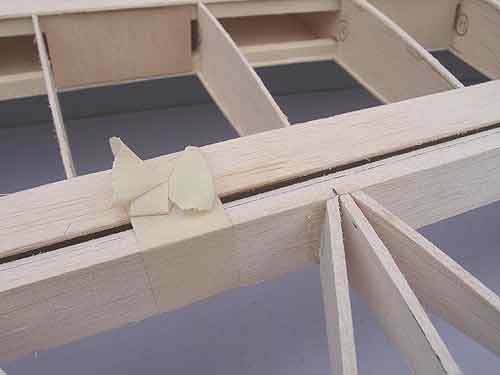 Separate from the wing and glue in place the remaining 1/4″ sheet balsa LE. 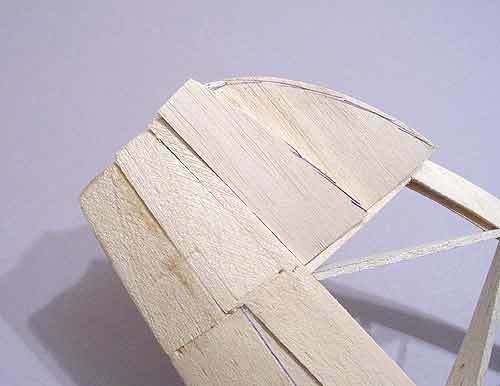 Sand the LE to a round profile, and hinge up the aileron to the wing. Spend half an hour or so fiddling with the fit between the shroud and the aileron LE until the aileron moves up and down without undue binding. Now you can add all the plywood gussets etc., the job is done! 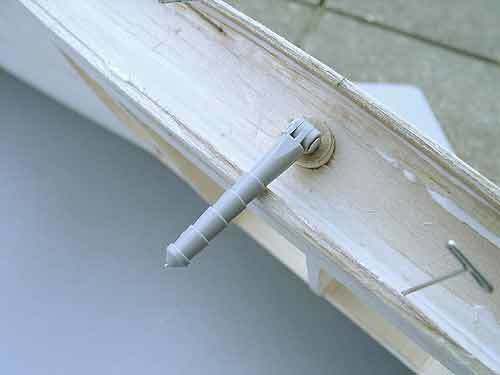 by leaving the final sanding until after the hinging process it means that if the hinges aren’t quite central, you can compensate for this in the final sanding process. 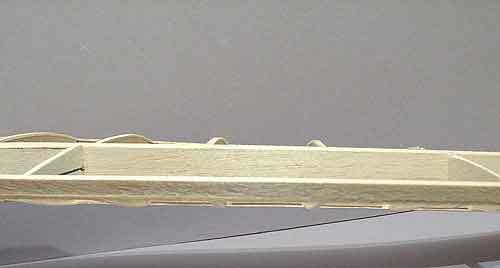 This is also a speedy business, you should be able to build up the basic aileron with an evening’s intensive work. I have to be honest here, although the Petrel’s ailerons started off perfectly straight, by the time they were covered and painted a certain waviness had crept in, but I guess that would be liable to happen whatever process you used. Obviously this procedure will work just as well for the tailplane/elevator set up, and for the rudder too., cutting the total building time of any project by a significant amount.